Download "CITIZENS PROPERTY INSURANCE CORPORATION. INVESTMENT POLICY for. Claims Paying Fund (Taxable)"
1 CITIZENS PROPERTY INSURANCE CORPORATION INVESTMENT POLICY for Claims Paying Fund (Taxable) INTRODUCTION Citizens is a government entity whose purpose is to provide property and casualty insurance for those Floridians who cannot obtain affordable coverage in the private market. Citizens strives to pay policyholder claims in a timely manner while maintaining quality customer service and a sound financial posture. Prudent investment of its cash can serve to further these goals. 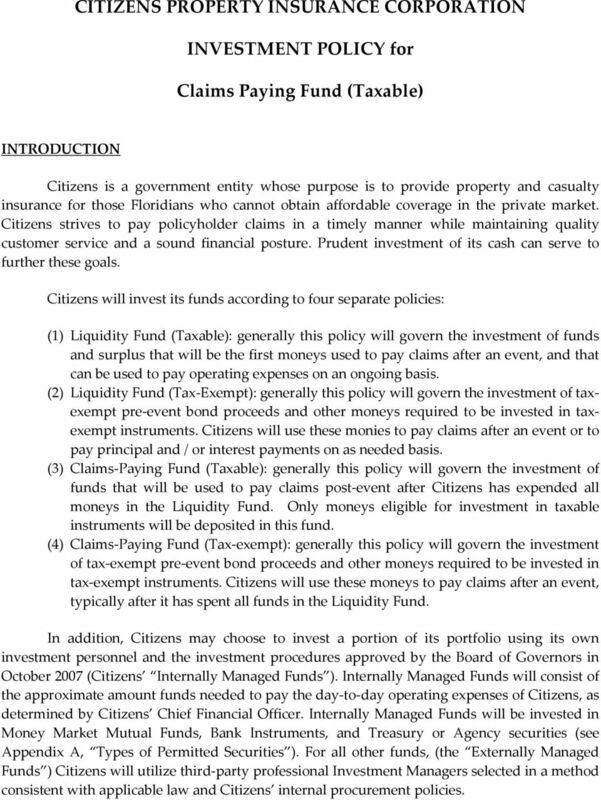 Citizens will invest its funds according to four separate policies: (1) Liquidity Fund (Taxable): generally this policy will govern the investment of funds and surplus that will be the first moneys used to pay claims after an event, and that can be used to pay operating expenses on an ongoing basis. (2) Liquidity Fund (Tax-Exempt): generally this policy will govern the investment of taxexempt pre-event bond proceeds and other moneys required to be invested in taxexempt instruments. Citizens will use these monies to pay claims after an event or to pay principal and / or interest payments on as needed basis. (3) Claims-Paying Fund (Taxable): generally this policy will govern the investment of funds that will be used to pay claims post-event after Citizens has expended all moneys in the Liquidity Fund. Only moneys eligible for investment in taxable instruments will be deposited in this fund. 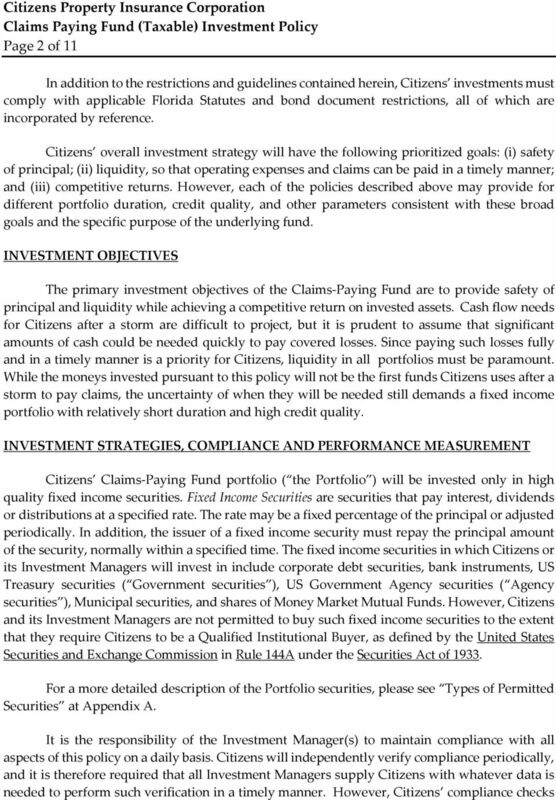 (4) Claims-Paying Fund (Tax-exempt): generally this policy will govern the investment of tax-exempt pre-event bond proceeds and other moneys required to be invested in tax-exempt instruments. Citizens will use these moneys to pay claims after an event, typically after it has spent all funds in the Liquidity Fund. 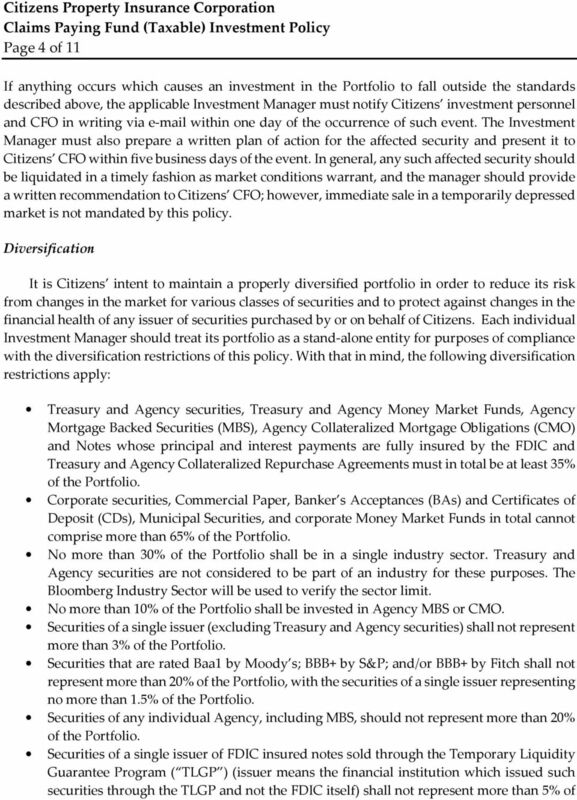 In addition, Citizens may choose to invest a portion of its portfolio using its own investment personnel and the investment procedures approved by the Board of Governors in October 2007 (Citizens Internally Managed Funds ). Internally Managed Funds will consist of the approximate amount funds needed to pay the day-to-day operating expenses of Citizens, as determined by Citizens Chief Financial Officer. Internally Managed Funds will be invested in Money Market Mutual Funds, Bank Instruments, and Treasury or Agency securities (see Appendix A, Types of Permitted Securities ). For all other funds, (the Externally Managed Funds ) Citizens will utilize third-party professional Investment Managers selected in a method consistent with applicable law and Citizens internal procurement policies. 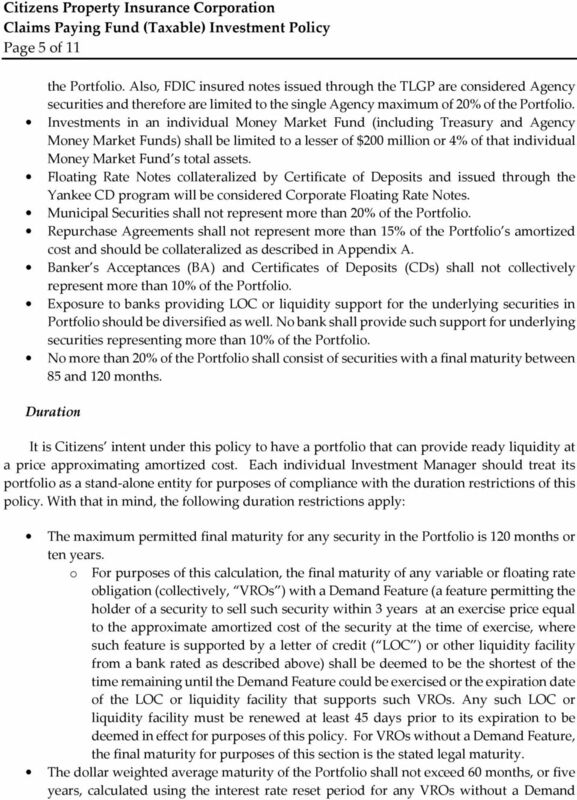 3 Page 3 of 11 do not relieve the Investment Managers of their responsibility to perform such checks on a daily basis. 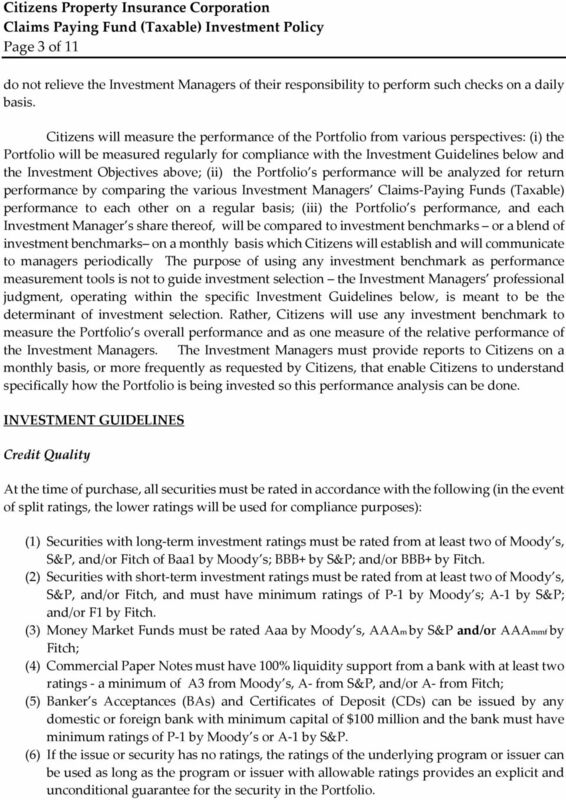 Citizens will measure the performance of the Portfolio from various perspectives: (i) the Portfolio will be measured regularly for compliance with the Investment Guidelines below and the Investment Objectives above; (ii) the Portfolio s performance will be analyzed for return performance by comparing the various Investment Managers Claims-Paying Funds (Taxable) performance to each other on a regular basis; (iii) the Portfolio s performance, and each Investment Manager s share thereof, will be compared to investment benchmarks or a blend of investment benchmarks on a monthly basis which Citizens will establish and will communicate to managers periodically The purpose of using any investment benchmark as performance measurement tools is not to guide investment selection the Investment Managers professional judgment, operating within the specific Investment Guidelines below, is meant to be the determinant of investment selection. Rather, Citizens will use any investment benchmark to measure the Portfolio s overall performance and as one measure of the relative performance of the Investment Managers. The Investment Managers must provide reports to Citizens on a monthly basis, or more frequently as requested by Citizens, that enable Citizens to understand specifically how the Portfolio is being invested so this performance analysis can be done. INVESTMENT GUIDELINES Credit Quality At the time of purchase, all securities must be rated in accordance with the following (in the event of split ratings, the lower ratings will be used for compliance purposes): (1) Securities with long-term investment ratings must be rated from at least two of Moody s, S&P, and/or Fitch of Baa1 by Moody s; BBB+ by S&P; and/or BBB+ by Fitch. (2) Securities with short-term investment ratings must be rated from at least two of Moody s, S&P, and/or Fitch, and must have minimum ratings of P-1 by Moody s; A-1 by S&P; and/or F1 by Fitch. 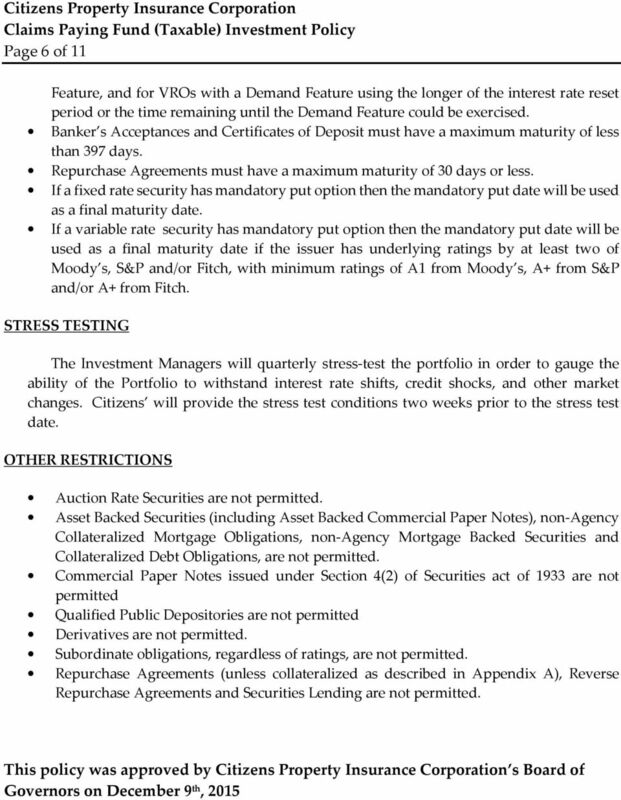 (3) Money Market Funds must be rated Aaa by Moody s, AAAm by S&P and/or AAAmmf by Fitch; (4) Commercial Paper Notes must have 100% liquidity support from a bank with at least two ratings - a minimum of A3 from Moody s, A- from S&P, and/or A- from Fitch; (5) Banker s Acceptances (BAs) and Certificates of Deposit (CDs) can be issued by any domestic or foreign bank with minimum capital of $100 million and the bank must have minimum ratings of P-1 by Moody s or A-1 by S&P. (6) If the issue or security has no ratings, the ratings of the underlying program or issuer can be used as long as the program or issuer with allowable ratings provides an explicit and unconditional guarantee for the security in the Portfolio. 9 Page 9 of 11 fixed-rate mortgage loans; however, adjustable-rate mortgage loans (ARMs) are also pooled to create the securities. 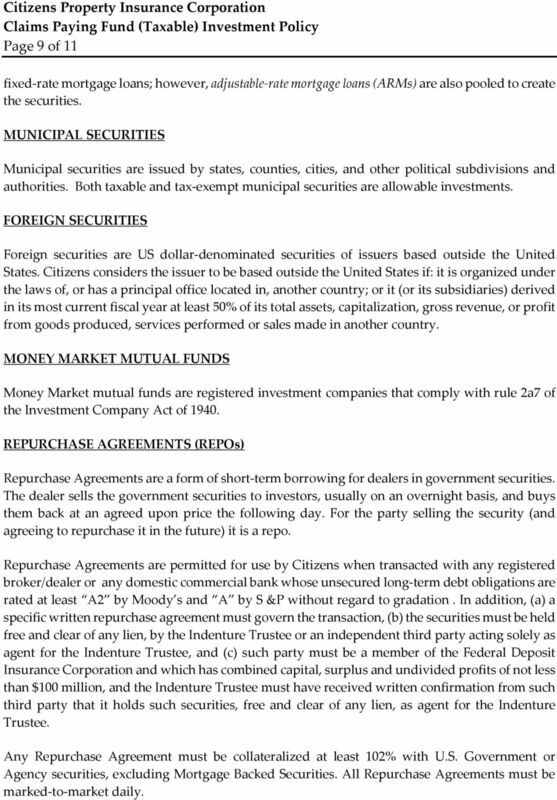 MUNICIPAL SECURITIES Municipal securities are issued by states, counties, cities, and other political subdivisions and authorities. Both taxable and tax-exempt municipal securities are allowable investments. FOREIGN SECURITIES Foreign securities are US dollar-denominated securities of issuers based outside the United States. Citizens considers the issuer to be based outside the United States if: it is organized under the laws of, or has a principal office located in, another country; or it (or its subsidiaries) derived in its most current fiscal year at least 50% of its total assets, capitalization, gross revenue, or profit from goods produced, services performed or sales made in another country. MONEY MARKET MUTUAL FUNDS Money Market mutual funds are registered investment companies that comply with rule 2a7 of the Investment Company Act of REPURCHASE AGREEMENTS (REPOs) Repurchase Agreements are a form of short-term borrowing for dealers in government securities. The dealer sells the government securities to investors, usually on an overnight basis, and buys them back at an agreed upon price the following day. For the party selling the security (and agreeing to repurchase it in the future) it is a repo. Repurchase Agreements are permitted for use by Citizens when transacted with any registered broker/dealer or any domestic commercial bank whose unsecured long-term debt obligations are rated at least A2 by Moody s and A by S &P without regard to gradation. 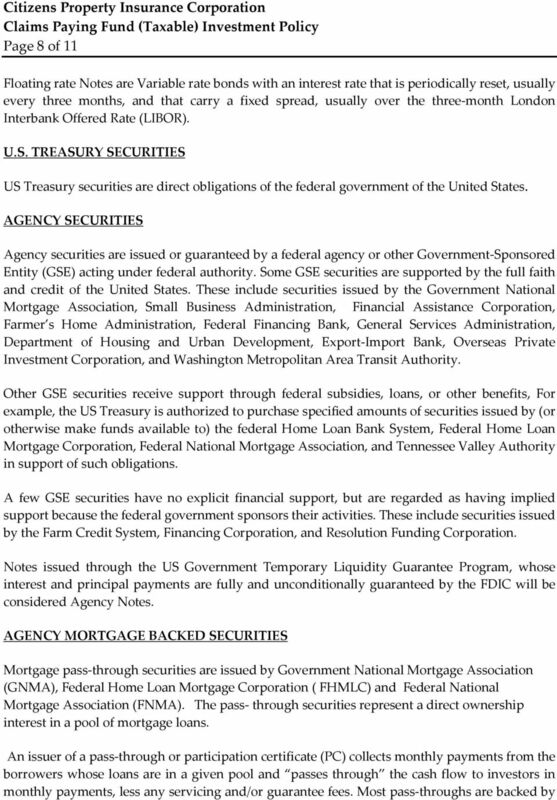 In addition, (a) a specific written repurchase agreement must govern the transaction, (b) the securities must be held free and clear of any lien, by the Indenture Trustee or an independent third party acting solely as agent for the Indenture Trustee, and (c) such party must be a member of the Federal Deposit Insurance Corporation and which has combined capital, surplus and undivided profits of not less than $100 million, and the Indenture Trustee must have received written confirmation from such third party that it holds such securities, free and clear of any lien, as agent for the Indenture Trustee. Any Repurchase Agreement must be collateralized at least 102% with U.S. Government or Agency securities, excluding Mortgage Backed Securities. All Repurchase Agreements must be marked-to-market daily. The State of New York Deferred Compensation Board Stable Income Fund INVESTMENT POLICIES AND GUIDELINES. December 13, 2013. Office of the State Treasurer 200 Piedmont Avenue, Suite 1204, West Tower Atlanta, Georgia 30334-5527 www.ost.ga.gov INVESTMENT POLICY FOR THE OFFICE OF THE STATE TREASURER POLICY December 2015 O.C.G.A. Chapter 3 - Selecting Investments in a Global Market Questions to be answered: Why should investors have a global perspective regarding their investments? What has happened to the relative size of U.S.
Request for Proposal (RFP) Investment Advisory Services THE WIKIMEDIA FOUNDATION Wikipedia is the world's largest and most popular encyclopedia. It is online, free to use for any purpose, and free of advertising. 1.0 Purpose The purpose of this Debt Management Policy ( Policy ) is to establish parameters and provide guidance as to the issuance, management, continuing evaluation of and reporting on all debt obligations. City of Battle Ground Investment Policy Policy It is the policy of the City of Battle Ground to invest public funds in a manner consistent with the greatest safety and protection of the City s investments. INVESTMENT GUIDELINES FOR MONEY MARKET POOL discretionary Money Market Pool is expected to pursue their stated investment strategy and follow the investment guidelines and objectives set forth herein. Saving and Investing How does investing contribute to the free enterprise system? How does the financial system bring together savers and borrowers? How do financial intermediaries link savers and borrowers? OAKTREE HIGH YIELD BOND FUND Institutional Class OHYIX Advisor Class OHYDX Before you invest, you may want to review the Fund s prospectus, which contains more information about the Fund and its risks. Organizes and sponsors conferences, symposia and workshops to educate consumers and policymakers. Chief Executive Officer shall mean and include the Administrator of Mammoth Hospital and the District. 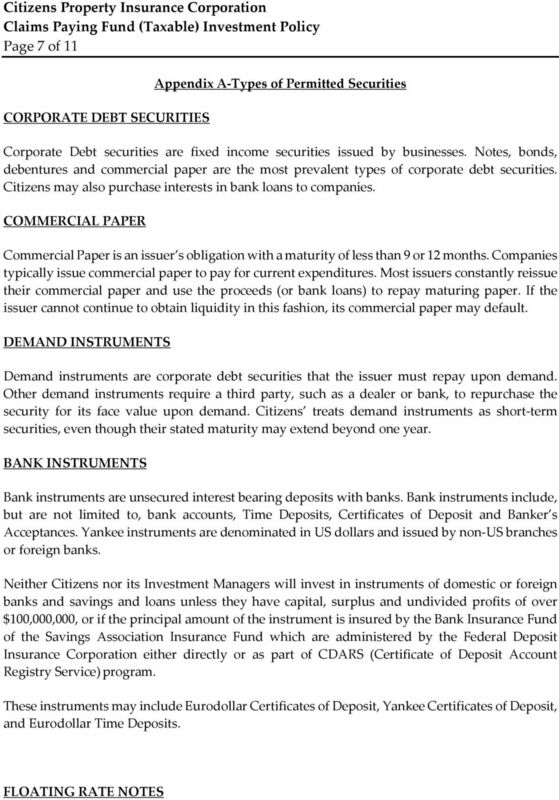 Priority Senior Secured Income Fund, Inc.
Commercial paper collateralized by a pool of loans, leases, receivables, or structured credit products.